Always install your MetaMask wallet through metamask.io, avoid me-too brands. Never disclose your MetaMask seed phrase (twelve common English words) to any person or any website. Never disclose your wallet’s private key to any person or any website. 1.Go to https://metamask.io, follow the link for your favorite browser. For this How-To, we’ll be using Chrome and the Chrome Extension. 2. The Get Chrome Extension link on https://metamask.io should take you to the Chrome web store and open the MetaMask Extension. The blue button in the upper-right corner will let you add the extension to Chrome. 3. Once you’ve installed the MetaMask Chrome Extension, the first thing you’ll see is the MetaMask How it Works video at https://metamask.io/#how-it-works. Go ahead and watch it, it’s short and informative … like this document. You should also have a little orange fox head icon in the upper-right corner of your Chrome browser. Click that to start setting up your wallet. 5. Next comes the privacy notice. It’s short and worth reading. The key takeaway is to sign out of MetaMask when you’re not using it. Click Accept. 6. Next comes the Phishing Warning, a brief read warns you of fake MetaMask windows that ask for your MetaMask seed phrase (something you should NEVER DISCLOSE TO ANYONE). 7. The next screen lets you set your password, gives you twelve plain-English “seed words”. These are CRITICAL TO THE SECURITY OF YOUR ACCOUNT. Copy or download them and keep them in a safe secure place. No site should ever ask for your seed words. Giving these words away can result in theft of all your tokens. Loss of these words could make it impossible to open your wallet and access your tokens. 8. Now you’re settled in. One of the main elements on the MetaMask extension is the “three dot menu.” Let’s have a look at what’s available. 9. 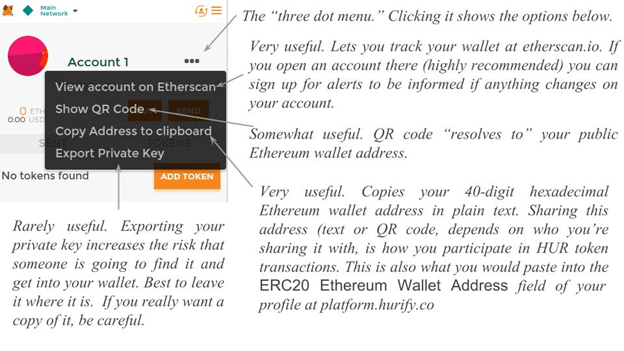 Using the 3-dot menu, copy your wallet Address to clipboard. 11. 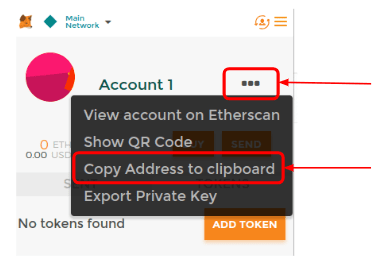 Go to the Public Ethereum Wallet Address of your profile, right-click and select Paste. You should get a 42-character string that begins with 0x and has a random sequence of numbers and letters after that. Save your profile. 12. That’s it! You’re ready to begin earning and spending HUR with your MetaMask Wallet!